I want my little boy back. It’s not that I’ve lost Isaac as such. But there is no escaping the fact that he is no longer the innocent little toddler which, in some way, he will always be in my mind’s eye. In his place is an increasingly aware boy who is fast discovering the reality of the world he lives in, with all that is good and bad about it. It is a double-edged sword, a bitter-sweet moment, and although I know I have to let go of his hand at some point, I am finding it one of the hardest things I have had to do as a parent so far. Once a child starts to lose his innocence, you cannot put the genie back into the lamp. I know it has to happen eventually – but did it have to be so soon? Over the past couple of weeks, I have watched Zac take two huge strides forward on the path to adulthood. The two events have been very different, but both are equally saddening. Do they have one in my size, Daddy? As I said at the time it was an endearing trait, and one which Heather and I neither encouraged nor discouraged – it was just part of who he was. Indeed, a part of me was immensely proud of him for not conforming to convention. But my fear always was that he would eventually be forced by peer pressure to abandon his preference for something more ‘normal’ or, worse still, bullied about it. I thought that change might happen when he moves up to primary school next September. Instead it happened last week. I can only assume that he has realised, whether through observation or interaction with his male mates at pre-school, that pink is more usually associated with girls. Almost overnight, pink became distinctly uncool. Pink clothing is now definitely out. He no longer wants to drink out of his pink cup. Instead, blue is the colour for him now. I have a vivid memory of the first time I confronted the spectre of death as a child first-hand. I was nearly seven. My paternal grandfather in Malaysia fell gravely ill. I can remember my parents’ anxiety as they hastily arranged for us to fly out at the first possible opportunity. While my parents visited his bedside in hospital, I was kept outside and my various aunts and uncles sat with me. The first time I saw him on that trip was when I paid my respects to his lifeless body laid out in his coffin at the family home before the funeral. I can remember details of the burial itself better than I can recall what I did last weekend: the stickiness of a hot and humid early summer’s day, the stifled grief of my dad’s family, the grittiness of the handful of earth I was asked to throw onto the coffin. Most of all I know that I was by then old enough to understand the gravity of death, and feel genuine sorrow for a relative I could barely remember. It was the first time I had stared death in the face. I will never forget it. Isaac was barely half the age I was then (he does not turn four for a couple of weeks) when Heather’s stepfather – his ‘Gramps’ – passed away on the afternoon of Remembrance Day: 11/11/11. In the same way that my initial encounter with mortality left an indelible mark on me, so too Zac’s first brush with death has had a significant impact on him. Zac already understood the concept of death, at least as it relates to plants and bugs. When I explained to him that Gramps was very ill in hospital and might not come home, he was emotionally developed enough to comprehend that this was a cause for great concern. We never took Zac to see him before he passed away but we did explain to him before the funeral that he had died – and Zac was genuinely sad. He immediately grasped the idea that he would never see Gramps again, and commented that “it doesn’t feel like Nana and Gramps’ house any more”. Out of the mouths of babes. 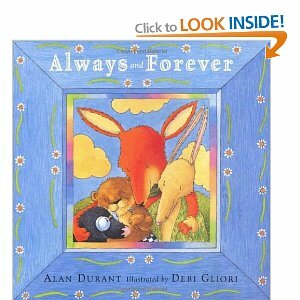 Over the past few days, we have introduced him to Always and Forever, a children’s book which gently broaches the subject of death, mourning and remembrance. It has quickly become compulsory reading every night. What has amazed me is the way he has completely grasped the subject matter. Where he normally bombards me with questions whenever we read a new book, he instead sits quietly and reflectively. Unprompted he told me the story made him sad, and when I asked him if he understood what it was about he immediately replied, complete with a wobbly bottom lip, “Fox died, just like Gramps did.” I don’t think I have ever wanted to just hold my boy in my arms, hug him and never let him go as much as I did at that moment. And then he popped the killer questions: “Why did Gramps die?”, which was followed by “Will I die?” as tears started welling up in his eyes. There have been only a few times in my life when I have really wanted the earth to open up and swallow me. This was one of them. Daddy, I’d really miss you if you died. I don’t know whether Zac is ahead of the curve in terms of his rational and emotional understanding of death. Actually, it really doesn’t matter. All I know is that I am simultaneously impressed and saddened that this not quite four-year old child already knows so much. We reached a watershed moment last night. The genie is out of the lamp. The cork is out of the bottle. There is no turning back. That, even more than the thought of his Gramps’ death, is what saddens me the most. There is no escaping the fact that our little boy is growing up. Zac has reached the end of the innocence. Posted in A dad's life, Journal and tagged death, fatherhood, parenthood, Parenting. Bookmark the permalink. WOW. What a moving observation about how your little guy is starting on that road to experience. I am glad he has you and Heather in his life to try to slow down his rush from innocence. Thanks for sharing. Tim, thanks for sharing. Very heartfelt and moving, as always. Someday I hope to be able to write about my future children the way you do about your boys. OK well that made me boo my eyes out! Thanks all for your kind comments. In particular, seeing Zac’s response to his Gramps’ passing has really brought home how much he has developed and matured over the past year. Kids really do grow up so fast! You brought me to tears. The book sounds fantastic & I shall have to remember that one for future. I think its a phase they go through around this age – which for you & your boy has been compacted by rraki life experience – my son has spent many a walk to school talking to me about how I was going to die when I was old, how he would miss me & that I wouldn’t be there when he was a grown up & why my grandad died (before he was born) … All very tricky to get your head round on a Tuesday morning dashing to school. Their questions & understanding is so innocent. I know. They ask the most innocent and yet most profound questions – the sort of things that as adults we often try to repress. I know. Knowing that we’re not planning on having any more kids, I keep having to remind myself to take in every moment while I can. Oh, definitely. I think we’d both been hoping that he would at least see the pink phase through to the end of pre-school. It was such a big part of who he was – and it was lovely that his friends’ mums, his grandparents and even people like his hairdresser all bought into it – the latter always fulfilled his requests to get his nails done in pink when he was having his hair cut. Of course, it probably saved him a lot of teasing him when he started in primary school that he stopped, but it was still a very sad day nonetheless. Even now, 2+ years later, people still talk about his love of pink. As for dealing with death, losing his Gramps was one thing. But I’m dreading the inevitable day when one of his Grandma and Grandpa passes away. He’s so close to them, and being already six rather than not-quite-four he will feel it so much more. But we all have to deal with it eventually and find our own way through, I guess.